Restrictions on the sale of fish caught in the provincial park prevent the lodge from selling what Trotter or anyone else brings up from the river, which seems like a lake, gaping up to 28 kilometres in width. But Sand Beach fishing guests will store their catch and bring it back to Toronto, Kitchener or elsewhere with them. 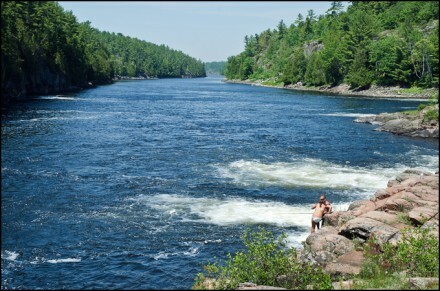 The river is known for pickerel (also called walleye by many Americans), northern pike, and bass. Sand Beach is the only lodge in the French River that currently hires fishing guides, according to Clarence LeDuc, who was born in the area and has worked as a guide for more than 30 years. With LeDuc’s help, our group of less-than-accomplished anglers catches eight fish in all, including six in a 15-minute flurry during our morning outing. With that bounty, we stop for a break, getting out of the Sand Beach pontoon boat that brushes up on the shore of an island, one of thousands that interrupt the French River. The names of the islands lack imagination and somehow that seems amusing. There’s 5-Mile Island and 12-Mile Island and Burn Island, “because it burns,” LeDuc says matter-of-factly while looking over at the trees that can catch fire when the temperature spikes toward 40 degrees Celsius. The rock we’re on? For the moment, it’s Lunch Island. LeDuc guts the fish we’ve caught and tosses the excess to the sea gulls who congregate on the millennia-old rock for a feast. He coats the pickerel and pike in flour and fries them in a huge skillet over an open fire that blisters the wood our group has recovered from the brush behind us. It’s mid-afternoon when we plate the fish, the baked beans, and the potato hash LeDuc has prepared on this shore lunch. The food is delicious, the view decadent, the experience sublime. You could do this over and over and over again and want to do it still. Directions from Toronto: Take Highway 400 North toward Sudbury. Highway 400 turns into Highway 69 North. Turn right on Highway 607 just past the French River Trading Post. Follow the clearly marked signs to Dry Pine Bay Road and the lodge. Wildlife viewing: Black bears, moose, and eagles are among the wildlife you will have the opportunity to spot. French River is also home to the the Massasauga rattlesnake, the only venomous snake in Ontario (but they’re shy, guide Mary Cameron of the visitor centre says). French River itself runs from Lake Nippising to the north down to Georgian Bay. Rates: Nightly rates start at $165 per person, and include breakfast, dinner, and use of amenities, including canoes and kayaks. Fishing boats can be rented for $115 and up. Visit the Rates page on the website for full details, including guide rates. Accommodations: The lodge’s season runs until October 8, 2012. Its clean, rustic cabins include comfortable beds and fireplaces, but O’Rawe admits these are not luxury accommodations. You won’t find flat-screen TVs or room-darkening curtains and Internet access is spotty.